This very quiet, authentically restored old farmhouse in the north of the island offers an enchanting atmosphere for all recreation seekers who value their privacy. In addition to a cozy living room with sitting area and fireplace, there are two bedrooms – a larger upstairs with old wooden ceiling and a smaller but no less charming bedroom with original old beams on the lower floor. Separate from the kitchen, which has been lovingly furnished and equiped is a bathroom with shower reached via a small hallway with closets and storage space. The interior of the house is simple but has been chosen with great attention to detail and retains the original charm of an old farmhouse. The vine covered veranda is completely finished with wood including a tradional wooden table and chairs, perfect to relax in the shade with a beautiful view of the garden and the surrounding mountains or to eat together. A stone staircase leads down to a large pool where you can totally relax on luxurious sunbeds. The farm is completely environmentally friendly, solar powered and is equipped with enough solar panels on the roof to provide electricity and hot water. Night batteries provide the energy needed and if at times there is longer cloud cover which hardly occurs in the summer, a power generator supplies the house and charges the batteries. Close to the farm is a small, very quiet and tourist free beautiful rock beach whilst other sandy beaches can be reached by car quickly. 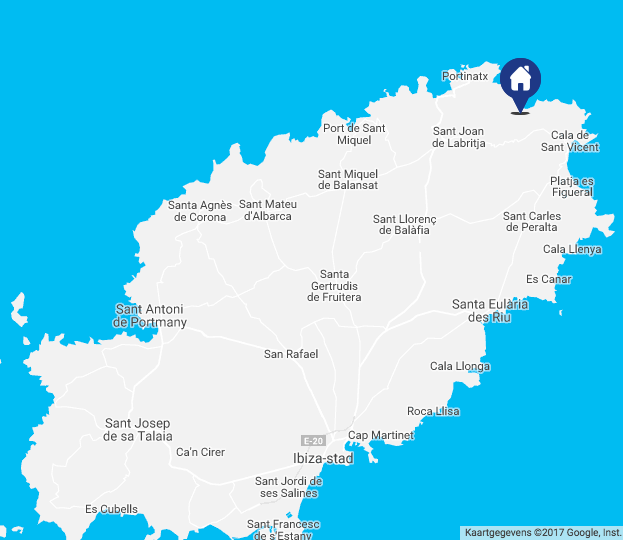 The closest villages are Cala San Vicente, Sant Carles and Sant Joan, here you will find supermarkets, pharmacies and great restaurants.